Planetizen, the indispensable online source for planners, has just released its annual list of the ten best books in the planning field. A surprising number have a direct link to Vancouver and the SFU City Program. “a straightforward guide that lays out the essential steps and best practices for running a productive design charrette” – featuring Metro Vancouver! Next up: Doug Farr‘s Sustainable Urbanism: Urban Design With Nature. Doug will be the featured speaker at another Century Group-sponsored lecture on March 11. Details to come. More on Chris and his analysis in Price Tags 99. While Vancouver’s urban design generally gets high praise, many are critical of its architecture. Where, they ask, are the iconic buildings? Why do our highrises all look the same? To discuss this, we’ve asked a panel of Vancouverites to address the nature of contemporary architecture and urban design. Join Planning Director Brent Toderian, Globe-and-Mail critic Trevor Boddy, architect Bing Thom, and journalist Hadani Ditmars at SFU Harbour Centre (515 West Hastings Street), 7 pm, on Friday, February 1st. Also: an update on how the City deals with design in the public realm, with Scot Hein, senior urban designer at the City’s urban Design Studio. Admission to public lectures is free; reservations are required. Email cstudies@sfu.ca or call 778-782.5100. Assigned reading: Brent Toderian did his blog post at Planetizen on whether Vancouver suffers an icon deficit. Lots of response. And Trevor Boddy in his Globe and Mail column took on the question of whether Robson Square (certified iconic) needs a clamshell. Kudos to Anthony Perl and his colleagues at SFU Urban Studies for bringing in James Kunstler (author of “The Long Emergency”) as their first Fellow. That meant he had a week to tour the region, speak to students, staff, politicians and the public in a variety of settings (from the Carnegie to the Vancouver Club in one day). Those familiar with his writings and blog wouldn’t be surprised to find that what were once fringe opinions, bluntly expressed, are now almost mainstream. If you missed Kunstler this week, despair not: you can hear him in full flight at the TED site (Technology, Entertainment, Design) here. Christopher Hume of the Toronto Star has a recent column on the competition results for a new park at the foot of Jarvis Street. Ah, the waterfront, the waterfront. Does one dare believe in what it could be; or does one succumb to the cynicism of the day? The latter may be tempting, but it’s too easy. 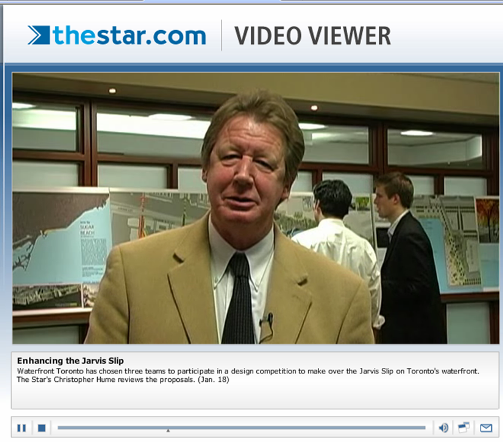 Besides, there is reason for optimism, especially when one sees the final-round proposals for the Jarvis St. Slip. Chosen through an invitational design competition, the three schemes are so good, each one should be built. That’s unlikely, of course, but one can always hope. Check out the results here – and remember them for the SFU City Program discussion on the state of Vancouver’s architecture and urban design on February 1. Details here. New Urbanist planner/achitect Andres Duany lecture filled the Four Seasons ballroom last Wednesay. Over 680 people registered. Bloggers Frances Bula and Stephen Rees have done a great job in conveying his provocative statements and ideas in detail. Click on the names above to read their comments. 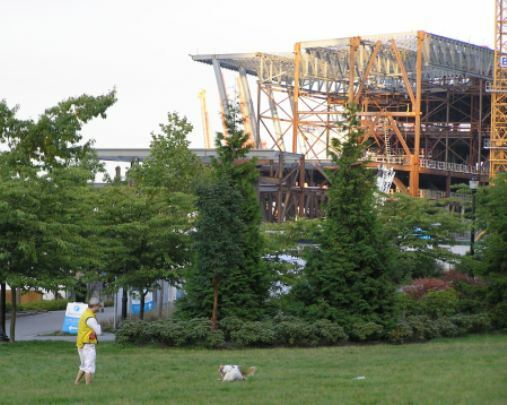 Last year, Sun columnist Miro Cernetig did a piece on the new convention centre expansion. From a design perspective, the convention centre is esthetically underwhelming, more a triumph of engineering than architecture. The word mediocre comes up repeatedly whenever I ask people who watch these sort of things in the city. Actually, I was a bit more complimentary in the interview. No, it’s not going to be great building, competitive with other ‘iconic’ structures going up these days. But I think it’s successful in one remarkable way. Large exhibition spaces are, unavoidably, big honkin’ boxes – usually with vast blank walls. This new box, placed on a prime piece of waterfront, actually complements the verticality of the Coal Harbour skyline when seen from Stanley Park. Seen from Coal Harbour Green, it plays well with the sails of the convention centre. Seen from Burrard Street, its glassy facade respects the view corridor and doesn’t overwhelm the Marine Building or present a blank wall to the city. Altogether, a difficult building on a sensitive site that fits in well. Not great, but good. But there’ll be more time to debate this point at the first “Paradise Builders” session the City Program is launching on Friday, February 1. Joint City Planning Director Brent Toderian, Globe and Mail architectural critic Trevor Boddy and others to discuss “The Challenges of Today’s Vancouver” (and whether our dearth of iconic structures is really a problem), at 7 pm, SFU Harbour Centre. Reservations are required. Email cstudies@sfu.ca or call 778-782.5100.